Today’s snack raid comes from my home country; the Philippines! Sky Flakes come in a lot of different varieties. You can get them plain or filled, and the varieties for fillings are endless. They span everything from sweet to savory and everything in between. There’s strawberry, chocolate, garlic, onion & chives, butter, and so on (you get my drift). 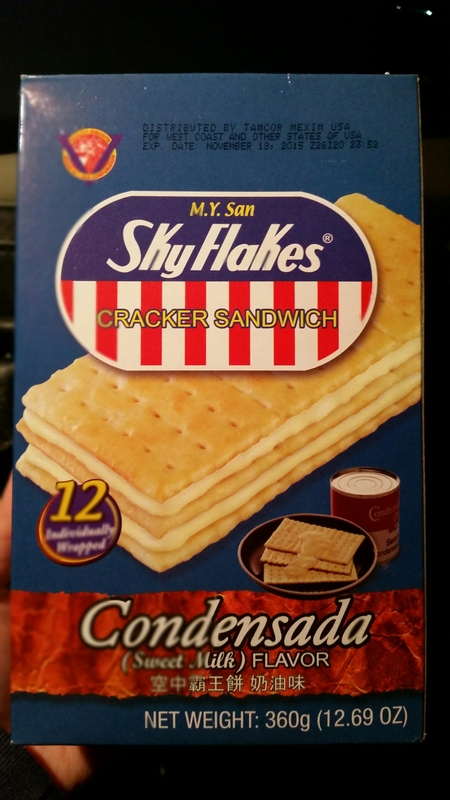 Think of Sky Flakes as the upgraded Filipino version of saltine crackers. This particular one I tried had a condensed milk filling (one I’d never had before). 3. Tastes like: Disappointed with this filling. It’s not sweet enough in my opinion. The condensed milk doesn’t really taste like anything; a bit like powdered milk that’s slightly sweet. This doesn’t compare to my favorite Sky Flakes that have strawberry filling. 4. Where to buy: Any Asian grocery store or Amazon.com. Yummy fried pork snack. There’s many different versions of chicharon from countries like Mexico, Puerto Rico, and a lot of other places in the world that have had a heavy Spanish influence. 3. Tastes Like: This has a light tang from the vinegar, but it’s light enough that it doesn’t over power your taste buds. 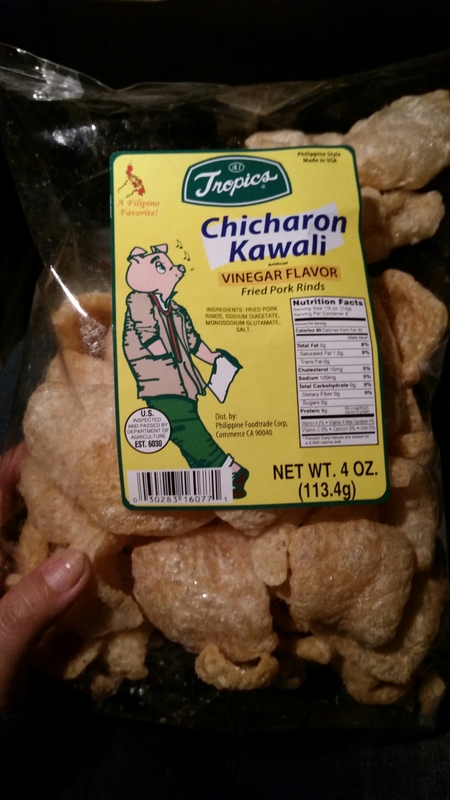 Good addition to the salty, crispy, crunch of the chicharon. 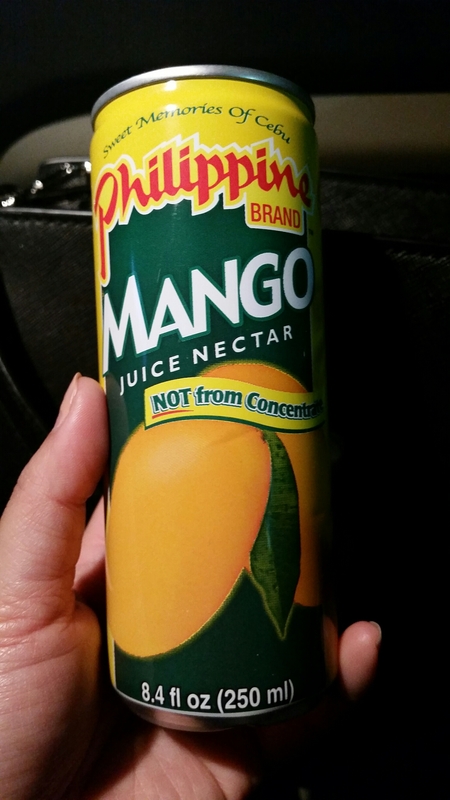 The Philippines are very famous for having the best mangoes in the world. So coincidentally you’ll find a lot of snacks and drinks in mango form. 3. Tastes like: Very ripe mangoes!! May be too sweet for some people. 4. Where to buy: Asian grocery store. I’ll be posting more snacks from the Philippines in a few weeks (maybe some of my favorites instead! ). Curios to know if anyone has had any of these snacks. Or if you recommend anything in particular…..If I can find it I’ll try it!